More than once in this book Louis Meisel says it is his last title about Photorealism. Don't worry though, this fascinating art movement hasn't come to an end, just that Mr Meisel feels that his three previous books and this latest one chronicle the movement that he has, more or less, been responsible for over the last forty years. Time to pass the baton to a younger art dealer and that person is Frank Bernarducci. The Bernarducci/Meisel Gallery in New York will continue to exhibit the paintings. This fourth Photorealism book features twenty-two artists of the thirty-three who were in the 2002, third edition and an additional eleven painters. Some names, in the first 1980 book, are still part of the movement. John Baeder powers on with this beautiful diners, Richard Estes still finds plenty of things reflected in the cities windows though fourteen paintings here show he has branched out to painting the mountains of Antarctica, Ron Kleeman sticks to cars and trucks and Ben Schonzeit carries on meticulously painting fruit and vegetables. There is some amazing work from the eleven newer artists, in particular two paintings of candy in jars by Roberto Bernardi, these have to be seen to be believed and Raphaella Spence creates remarkable cityscapes from America and Europe. 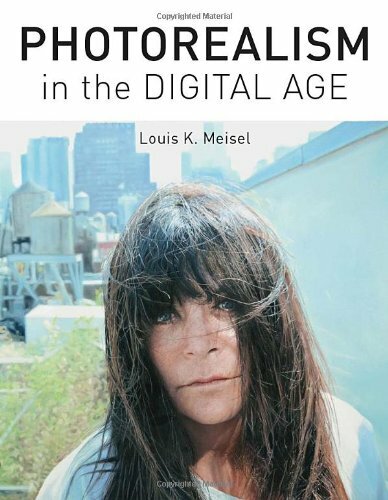 As this is his last book Meisel adds two interesting sections after the Photorealists pages. The first about the Verists features eight artists who create three-dimensional work, one them, Duane Hanson (1925-1996) has been working on life-size clothed figures since 1966, Jud Nelson carves everyday products out of marble and Marilyn Levine fashions totally realist clothing and various bags out of ceramics. I find it rather strange to see the Verists classed together with photorealist painters and they haven't appeared in the three previous books. The other section is devoted to promising artists, ten are listed each with four examples of their work. I'll tip Mike Bayne and Nathan Walsh as names to look for in the future. 'Photorealism in the digital age' follows the same format as the third 2002 edition and displays 823 works of art (this maybe 822 because John Salt's 'Grand Street parking 2009', picture 605, is repeated smaller with the same caption as picture 618) printed on a good matt art with a 200 screen. I think it's worth saying that some paintings are reproduced quite small, basically to get them all in and when some of the originals are several feet wide but get reduced to a postcard size or smaller the reducing sharpens up the detail and they look even more 'photographic' Meisel, on page twenty-nine, makes an interesting point about printing these this type of realism: because digital camera are now working with millions of pixels photorealist artists, using a pc, can create so much detail in their work that printing screens cannot adequately capture this. Collectors, curators, museum libraries and fans of this wonderful art form will all enjoy this final volume of the Meisel Photorealist catalog.